Market report of the 1,000 highest revenue B2C online stores for physical goods. 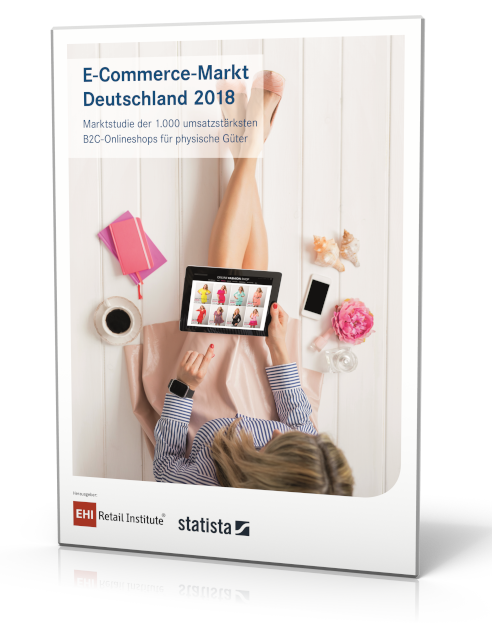 For the tenth time, in cooperation with the EHI Retail Institute, the E-Commerce market Germany 2018 report lists the 1,000 biggest German online stores for physical goods (with a focus on the B2C market) by online revenue generated in 2017. It is supplemented through the 2018 E-Commerce Market Austria/Switzerland report. The report is ideal for the acquisition of new partners, competition and market analysis. This report examines the German B2C E-commerce market from the supply side, through a detailed analysis of the biggest online stores by revenue in Germany in 2017. Services and rights of use (e.g. cell phone contracts), as well as shops selling only digital goods (e.g. Google Play) were not considered. The ranking is based on a detailed analysis of over 1,000 German online stores, which we firstly surveyed about their revenue in the context of the analysis. Additionally, the data was enhanced by multiple secondary data sources from professional databases (EHI, Bundesanzeiger, Statista). Based on existing data, the drivers of E-commerce revenue were identified and their influencing factors were quantified through a regression analysis, which allowed missing data to be approximated. The report consists of 2 professionally prepared documents: one PDF document and one Excel file with 1,000 data sets of online stores and around 180 columns.